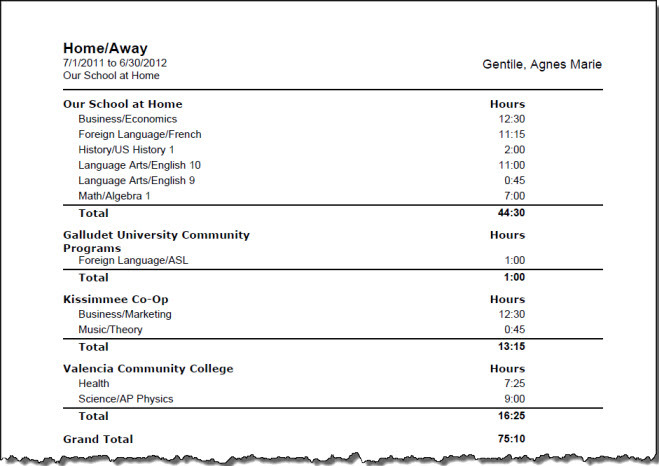 In some jurisdictions, there is a requirement to log the number of schooling hours that take place in the homeschool vs. those that occur elsewhere, such as a Co-op, vocational school, tutor, etc. If you need to maintain these records, the Assignment Location field, along with the Time Spent or Sessions field can help you log the information, and document it using the Home/Away report. You must have the Assignment Location field and either Time Spent or Sessions enabled in order to utilize this report. 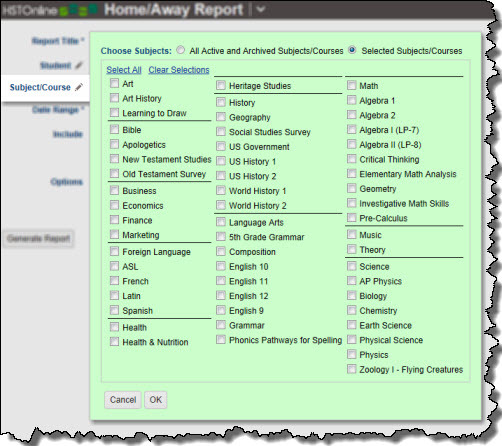 This layout lists Subjects/Courses in alphabetical order, grouped by their Core or Elective Status. 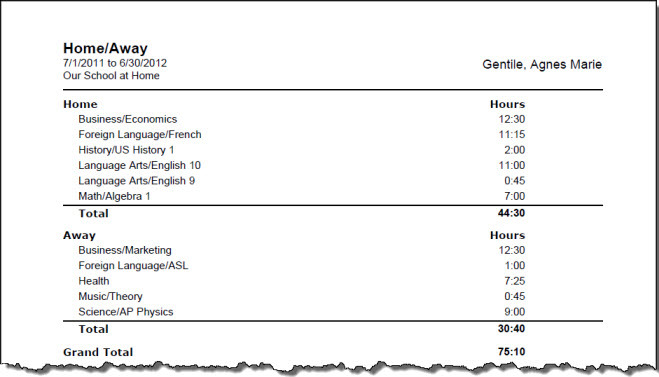 Total Time Spent or Sessions information is listed for each Subject/Course under the Home column or Away column. Sub-totals are provided for Core and Elective Subjects/Courses for each column of Home and Away. 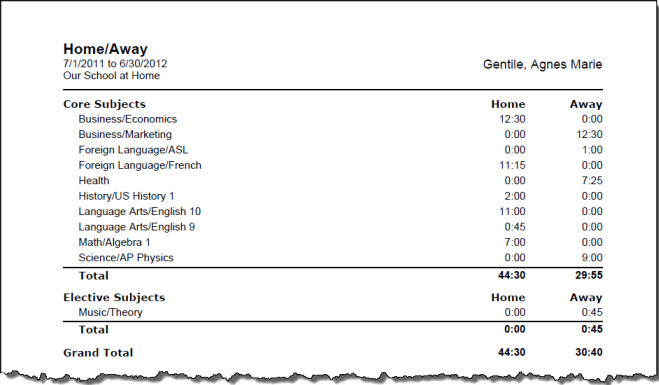 A grand total of Time Spent or Sessions is displayed for each column, the sum of the Core and Elective items together. This layout groups Subjects/Courses by Home and Away. Subjects/Courses taught in both Home and Away locations will appear in both lists. Sub-totals are provided for Home and Away. A grand total of Time Spent or Sessions is displayed, the sum of the Home and Away items together. This layout lists each Assignment Location and shows the Subjects/Courses taught in that location along with the Time Spent or Sessions. 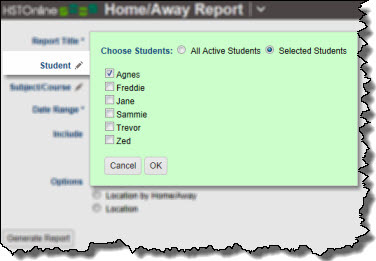 Assignment Locations designated 'Home' are listed first in alphabetical order, followed by those locations designated as 'Away', again in alphabetical order. A sub-total is provided for each individual location, along with a grand total for all locations. The default name for this report is: Home/Away. You can change the Report Title to anything you like, up to 150 characters. Incomplete Assignments: Any Assignment which has no checkmark in the Complete: Teacher box and falls within the selected date range will be included in the report. 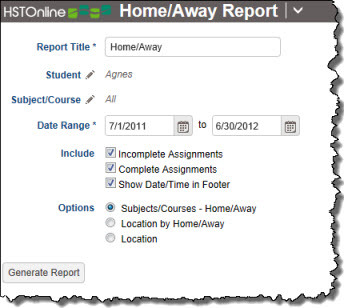 Incomplete Assignments where the Location field is blank will not be included in the report, even if the Time Spent or Sessions field is greater than zero. Complete Assignments: Any Assignment which has a checkmark in the Complete: Teacher box and falls within the selected date range will be included in the report. Complete Assignments where the Location field is blank will not be included in the report, even if the Time Spent or Sessions field is greater than zero. On the HSTOnline menu, click or touch 'Home/Away' under the 'Reports' section.